Emmeline is one of my heroes. She played a profound role in women’s journey to gaining citizenship and the right to vote, which leveraged many more gains for women. What do I most admire? I admire her ability to inspire women, of all classes, to rise up and claim their right to vote. I admire Emmeline’s courage and tenacity in the face of powerful and violent resistance. I admire her ability to think strategically and tactically, bringing about a new form of activism – “Deeds not words”. In fact she pioneered concerns that became central to feminism later in the century. And it is extraordinary that there is no statue to date in her home city of Manchester, celebrating her activism. We need a statue of Emmeline to inspire today’s women – to use their vote, to use their voice, and to champion those women left behind. So these are the reasons why I want to sculpt Emmeline. And as a feminist, I bring a strong political commitment to the project, underpinned by the many years I have spent promoting gender equality and women’s rights across the world. Of course, Emmeline did not do this alone. In 1903, she formed the Women’s Social and Political Union (WSPU), along with her daughters Sylvia and Christabel. The “Suffragettes”, as they came to be known, were made up of women from all regions of the country, all ages, from all classes. In the end it was all these women coming together and rising up, which won women’s right to vote. 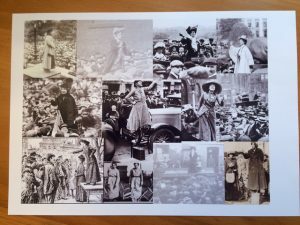 Above are some of the photos of Emmeline and other Suffragettes that have inspired my proposal. 4 Responses to "Why I want to sculpt Emmeline Pankhurst"